All but one of Santa Barbara’s beaches are open to the public following an oil spill on May 19. After the incident, two beaches were closed, about 20 miles north of the city of Santa Barbara. 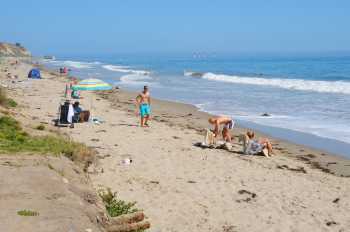 Santa Barbara County’s Public Health Department has done rigorous testing of water and air quality at Santa Barbara County-area beaches and has given their stamp of approval for public safety, specifically testing to levels that ensure the safety of children. The clean-up process of the oil spill in Santa Barbara has been swift and successful, enabling the county to open its beaches in time for summer fun. Popular El Capitan State Beach opened the week before July 4 while Refugio State Beach – where the spill occurred – will reopen July 17. In the meantime, swimming, surfing, kayaking and other activities are in full swing at Santa Barbara County’s numerous beaches spanning more than 100 miles. The beaches are open, clean and safe for visitors. Coastal hotels and beach vendors remain open for business. In addition to playing at the beach, there are many summer events on tap. These include: the California Wine Festival July 16-18; the French Festival, featuring a Poodle Parade (July 18-19); Old Spanish Days Fiesta August 5-9; and the 20th annual Santa Barbara Mariachi Festival on Aug. 8. The Santa Barbara Trolley Company offers a great way to see some of the area’s attractions, with ongoing daily narrated tours to sites such as Butterfly Beach, Stearns Wharf, Old Mission Santa Barbara and the Andrée Clark Bird Refuge. Don’t miss the Santa Barbara Zoo, set on a hillside estate with ocean views, where you can hand-feed the giraffes. What’s your favorite Santa Barbara beach?